Our motors agitate containers of food treated with enzymes. This artificial digestion allows scientists to measure the nutritional value of our food. Makers of high-end haunted house props put our motors to nefarious purposes. You can them see in action around Halloween time: pushing "empty" rocking chairs, moving animatronic monsters, opening coffin lids, and more. Physicians and students use simulated torsos and other body systems to train for medical procedures. We are proud to put our motors to work for this important equipment! You've probably seen mall stores where kids can stuff their own animal plushies. Our motors often perform a job of the utmost importance: puffing up the stuffing to ensure maximum softness and client satisfaction. 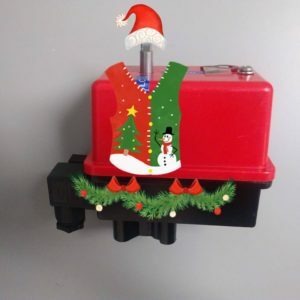 Inside each waving ROBOT SANTA, mechanical Mrs. Claus, animatronic angel, or rotating fir tree is a Festive Christmas Gearmotor doing its very best to spread joy and good tidings. Do you have an interesting motor application, or even an idea for one? Contact us. Maybe your product will make it into a future blog post!